Austin  The Cody Stephens Bill, House Bill 767 effectively was done in (for now) by the Senate Committee of Education vote of 6 to 5 last Thursday. Most of the testimony was in favor of the bill, that featured offering E.K.G. testing by portable machine for first time athletes participating in U.I.L. sports activities at low cost. The legislation was an update to the stethoscope and questions of the 14 point screening process performed on athletes now. Sudden Cardiac Arrest is the leading cause of young athletes to die on the field. It took the life of Cody Stephens on May 6, 2012 as he sat in his fathers recliner following football practice. His father, Scott Stephens, worked with Rep. Wayne Smith of Crosby, Dan Huberty of Huffman and many others to get a bill passed and in the House Committee on Public Education, HB 767 was approved 11 to 0. It was approved by the House 86 to 57. The stethoscope was invented in 1816 when a young French physician named Rene Theophile Laennec invented it to use examining a young female patient. It was a leap forward in medicine because it gave clearer audio to the heart. In the last century technology has moved on but legislation has seemingly stagnated. Israel, Italy and Japan have now adopted using E.K.G screenings on a large scale basis, with Italy reporting a 90% drop in sudden cardiac arrest following a study in 2006. Medical evaluations of the E.K.G. procedure say there is a false positive rate of 3% to 5%. Opponents of the bill say that false positives would incur undue financial stress on families with athletes that had nothing wrong with them. Ninety-two percent of American professional athletes get screening EKGs. Following the death of Atlanta Hawks center Jason Collier in 2005, all NBA players get a cardiac ultrasoundan even more reliable, if expensive, test than an EKGto exclude causes of sudden death. Several college sports programs, such as those at Purdue, Ohio State University, and Georgia Tech, also perform echocardiograms. Huffman ISD initiated EKG screenings for student athletes prior to the death of Cody Stephens. Effectively, the charge for the EKG would drop dramatically if routinely done on all students,. Medicare reimbursements grant about $50 though it takes only minutes to obtain and a minute to read. The Cody Setphens Go Big or Go Home Memorial Foundation is providing EKG screenings for about $15 and that is far less of a pay-off than $400 per screening. August 29 of this year, the Cody Stephens Memorial Foundation Go Big Or Go Home will have its annual fundraiser to provide funds to EKG Screen student athletes at the American Legion in Crosby. 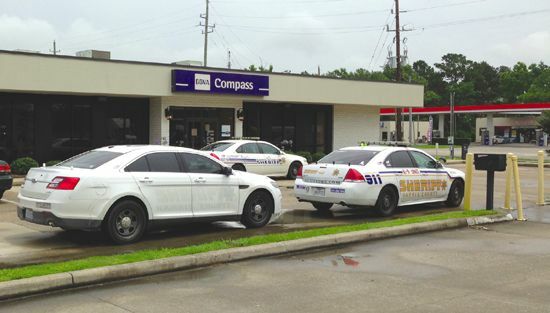 CROSBY  A man sits behind bars today charged with a single count of federal bank robbery in connection to a stickup of the BBVA Compass Bank here Monday. The FBIs Violent Task Force has a lot of work ahead of them as they try to determine the facts of a robbery at about 9:19 a.m. May 18 at 6011 FM 2100 and South Diamondhead Boulevard. Harris County law enforcement wondered what relationship, if any, two African- American men have that one entered the bank and asked a question then as he was exiting opened the door for another man that stood about 57 and weighted about 250 lbs. wearing a dark hoodie and had a stocking over his face. The F.B.I does not believe the two were connected at this time. The suspected robber charged into the bank ordered everyone onto the floor at weapon point and demanded cash. He selected one teller and ran out with some cash. No one was injured during the robbery. Seven local schools, and the daycares were locked down during this time. According to Dr. Keith Moore at 1:30 p.m. the schools were taken off lockdown. A man had been detained in the interim But his name and mug shot have been delayed release due to Department of Justice policy. In the last days of January this year another man pled guilty to robbery of a bank in the Galleria area, he received 78 months federal sentence in a U.S. Bureau of Prisons facility plus 4 years of supervised release and has to pay $2, 927.51. The Highlands Rotary Club held their annual Scholarship Awards Banquet on Monday evening of this week, and awarded 18 area students scholarships worth over $31,000. These are meant to help the students with their college expenses, as they graduate from local high schools. The event was held at the Highlands San Jacinto Community Center, and 100 students, family, and Rotarians attended. The keynote speaker was Goose Creek CISD superintendent Randall OBrien, on the subject of The Value of a College Education. OBrien was introduced by Rotarian Gilbert Hoffman, who noted that the superintendent had two college degrees, and was working on this third, a doctorate from Lamar University. But OBriens talk was peppered with anecdotal stories to start, about successful persons who did not have a college degree, and some even without high school credentials. So, what is the value of a college degree? OBrien said that no doubt you will benefit in the job market, and make twice as much money in your lifetime as the average person without a degree. But more importantly, you will have greater opportunities for choice, and a better life. And you will learn to work smarter because of the colllege experience. OBrien said that those without a job are 2% for college grads, but 6% for those without a degree. He urged the students to have a Life Plan in the future, set a goal, leading to a career choice. Dr. Larry White, chairman of the Rotary scholarship committee, thanked the 10 persons who helped judge the 66 applications that resulted in the 18 awards. He said the judgements were based on an applicants academic record, grades, monetary needs, extracurricular activities, interests and other intangibles, such as an essay or recommendation. The scholarships were originally awarded only to Highlands students, but over the years this has expanded, and this year four high schools were represented, including Goose Creek Memorial, Crosby High, Chinquapin Prep, and Baytown Christian Academy, and two in-college students. Goose Creek Memorial: Pooja Bhula, Jessica Crawford, Dianie Fontenelle, Alondra Garcia, Alyssa Henderson, Nelcy Ibarra, Dulce Montoya, Kendyll Reznicek, Tiffany Triola, Kevin Trejo, and Ariel Thiry. Crosby High School: Hannah Boring, Kelsey Fuchs, and Ally William. Baytown Christian Academy: Katlyn Burns. In-college students: Keely Walker, Madeline Walker. W. L. HERNDON D.D.S. SCHOLARSHIP, to Ariel Thiry, presented by his daughter, Patricial Scott. R. L. CREEL SCHOLARSHIP, to Kevin Trejo, Goose Creek Memorial High School, presented by his son Bill Creel. PAT McPHEE SCHOLARSHIP, to Kelsey Fuchs, presented by his widow Barbara McPhee. JAY E. BIRD SCHOLARSHIP, to Hector Guzman, presented by Weston Cotten. A special program feature was the reading of an Essay, which won a District 5890 competition, based on the Rotary Crede of the Four Way Test. The essay was read by Jessica Crawford, who had won a district-wide contest among the 60 clubs in the District. She was given a check for $3000 by Rotary Club president Raymond Gonzalez on behalf of the District. Her essay was based on personal experience, applying fairness and accuracy to her preparation of the high school yearbook, and its photos. She said the ethics taught in the Four Way Test became the standard upon which she was able to make decisions. To conclude the evening, Rotarians, students, and parents were invited to comment. BAYTOWN  From seven candidates to three elected in the Lee College Board of Regents election held last Saturday. The three with the most votes were Mark Himsel, Mark Hall and Weston Cotten. Hall and Himsel were in a reelection bid. Hall had 919 votes, Himsel 916 and Cotten 713. Cotten edged Gina Rivon who got 685 votes. Dan Mendoza got 556 votes and Daryl Fontenot got 553 votes. David Issac also ran and got 162 votes. 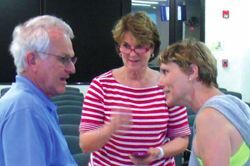 Cotten said at the Goose Creek Consolidated ISD Administration Building where the election results were posted immediately after the election was concluded, Its good, it really feels good. he drew a rugged breath and confessed, I hate campaigns. It worked, whatever it was, it worked. You just have to be thankful that enough people put that much trust in you  or, I was first on the ballot and they just went bonk, bonk . and hand mimicked someone picking the first name they came to on a ballot. Cotten is a second generation Lee College attendee, he also taught there. He is a practicing attorney in Baytown and had been the longest serving Trustee for the Goose Creek Consolidated ISD Board. Cotten is the Terry Davis Memorial Award recipient for this year, a distinction awarded for service to the Highlands Lynchburg communities by the Highlands-Lynchburg Chamber of Commerce. This is Weston Cottens first bid for Regent and he was third in the race. 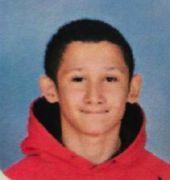 Harris County, TX – On Friday April 10, 2015, 12-year-old Joseph Glasco was was riding his bicycle northbound in the 17600 block of Janacek Road. As he crossed the westbound lanes of the 6600 block of US Highway 90, multiple vehicles struck the victim. Only one vehicle, a Hyundai Tiburon remained at the scene to help the boy. Joseph was taken to a local hospital but died shortly thereafter. Crime Stoppers of Houston urges anyone with information about who may have hit and killed Joseph Glasco to call 713-222-TIPS. A reward of up to $5,000 has been offered. CHANNELVIEW  After a series of meetings over the last two years that have taken place in Highlands, the federal EPA agency decided to expand the audience by holding the latest meeting last Thursday evening in Channelview, at the Flukinger Community Center. He showed that the waste pits were now covered with a temporary cap consisting of a geo-membrane, with a rock fill on top to hold it in place. This cap is what the PRP, or responsible parties, want to call permanent, but many including the San Jacinto River Coalition and the Galveston Bay Foundation, feel is not a satisfactory solution. Miller reported that the Draft Report on a solution to the Waste Pit problem, including storm studies and engineering criteria by the U.S. Corps of Engineers, due in April, has been delayed until June due to a computer crash, and then it will not be available to the public until fall, probably August. 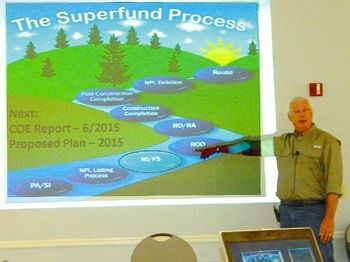 A government Superfund Review Board is meeting this month, he said, to evaluate the proposed solutions. After that, a final Report will be issued in December. Miller said the temporary cap is performing properly, with no leaks and no subsidence seen in the monitoring that has been done. The Final Report is expected to recomment one of the six Alternate Solutions that have been identified, ranging from leaving the cap intact with no further action, to a complete removal of the toxic materials. This last solution, which is expected to cost $92 million dollars and take 16 months to complete, is favored by many local residents, and activist Jackie Young, who has been the spokesperson for much of the grass roots public activity. Young was a resident of Highlands until her family got sick from the water, and they moved. She remains active with the TexansTogether association, and the San Jacinto River Association. The EPA representatives than passed a microphone to the audience members, asking for opinions and questions. Donn Walters emphasized that public input is an import aspect of evaluating the final decision on disposition of the waste pits. Pamela Barta, mother of Jackie Young, questioned why the state or county cant test the wells for toxins. She noted that since the 2004 flood and 2008 hurricane Katrina, much of the river sediment has been pushed upstream, presumably affecting water tables and wells. Anecdotedly she said that she knows of 8 people that have died in her Highlands neighborhood in 2014, presumably from toxic intake. Young said that tests have shown that there are over 300 chemicals present in the water and soils in the area. Oysters taken in Burnet Bay, downstream not far from the site, tested high for types of dioxins. Jim Stouhal, from Highlands, asked whether the large amount of barge traffic that has recently entered the river near the waste pits, has affected the cap or the spread of toxins. Gary Miller said that no erosion or migration has shown up in current tests. Miller pointed out that the study area now includes what is called the South Impoundment, an area south of I-10 near the Southwest Shipyards. He said that so far only one of 3 sites in this impoundment has shown paper mill wastes, and therefore they are still trying to determine the PRP, or Potential Responsible Party. The site also include oily waste, making them different from the sites in the North Impoundment.